Hiking With Dogs In Los Angeles - Explore Some Great Trails! It’s that time of year again where finding great places for hiking with dogs in Los Angeles and surrounding Southern California areas is on your “things to do” list. With the various terrains, those of you that want to hike with your dog have a huge selection to choose from. Let’s start with one of the most famous–Griffith Park. After all, this is the entertainment capital of the world and there’s so much to do and see! This fabulous leash-free park is a fenced in 1.6-acre park, which like many dog parks, has a fence separating areas for smaller dogs from the hounds. It’s a great spot for your dog to run free. The rest of the park is huge with more than 57 miles of on-leash trails within the park’s 4,017 total acres. Hikes with dogs in Los Angeles are fabulous thanks to this enormous paradise that comprises 50 miles of the Santa Monica Mountain Range. In fact, it’s the largest municipal park in America. Most of the trails are not highly developed and there are plenty of them. The wildlife is magnificent with birds tweeting until their heart’s content and plenty of squirrels dashing about. There are about 100 types of tree species at Griffith Park and fortunately for we outdoor lovers, much of it is still wild. If you are a visitor from out of town and awestruck by the Hollywood sign, you can make your way up to it as close as the law permits. You can get to the head of this hike via Franklin Ave. and Beachwood Dr. From mid Hollywood, go north on Beachwood Dr. for approximately 1.5 miles. When you reach the end of the street, you will run into Hollyridge Dr. Park your car. After about a block, you will see the trail on your left. It is quite wide, so you can’t miss it even though it is un-marked. It rises approximately 1.5 miles up Mt. Lee until you reach a fence. Also check out the 6-mile round-trip hike up Mt. Hollywood. The trail begins by Bird Sanctuary (where dogs are not allowed). It is at the left of its entrance and will take you on the perimeter of the Bird Sanctuary. You can get to this trail by taking Highway 5 to Los Feliz Blvd. exit and go west. You will reach Vermont Ave. or Hillhurst as they merge. Just past the Greek Theatre, you will see the trail. However, continue driving to the parking lot that is across from the Observatory. If you are looking to get a stunning view of the vast Los Angeles area that includes Eagle Rock, Burbank and Glendale, Beacon Hill is the one place you want to go when hiking with dogs in Los Angeles. Verdugo Hills, Los Angeles River, San Gabriel Mountains, Silver Lake, downtown Los Angeles and, on a clear day, even Santa Catalina Island will majestically present themselves before you. Even though it only elevates to 1,000 peek, it is a beautiful hike with breathtaking views. Beacon Hill stands on the eastern corridor of Griffith Park. As with other hiking trails in this magnificent Southern California mountain scape, Beacon Hill is open all year for ambitious people wanting to hike with their dogs in Los Angeles. 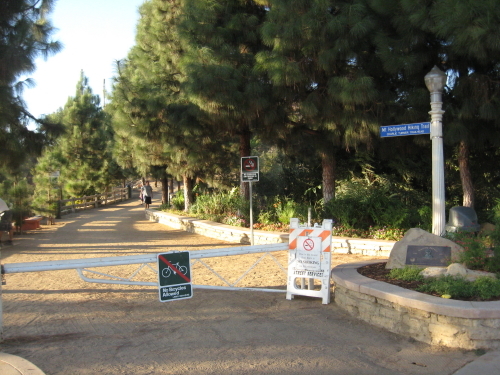 The trailhead to Beacon Hill begins west of the Interstate 5 Freeway, between Los Feliz Blvd (which is to the south) and the Ventura Freeway – SR 134 (which is to the north). Once you reach Los Feliz Blvd., turn north on Crystal Springs Dr. Go about 1.4 miles to an intersection where you will see a Ranger Station on the right. Turn left toward the merry-go-round parking lot until you come upon a blocked road. Here you will turn right into the parking lot. Begin your accent via Fern Canyon Trail and after approximately 80 yards, you will pass the first trail on the right and walk another 50 yards until you reach the part of the trail that bends left and follow it. Ignore the other trail that bends to the right. At 1 mile you will reach a five-fork junction. Take the left route and follow the beautiful mountain ridge line east to Bacon Hill. Coming from Interstate 5, you would take the Los Feliz Vlvd. exit and drive west to Crystal Springs Dr. and then turn right. Although directions sound a bit complicated, it is easy to find. One more thing…you won’t want to miss taking your dog on his or her first trail ride. It’s located at the park entrance from Interstate (I5). Please call the park at 323-913-4688 if you have questions about the various hikes. Truly, Griffith Park offers one of the greatest assortment of hikes with dogs in Los Angeles. There are plenty of things to do with your dog in Los Angeles. Visit the Vacation Pet Friendly’s Los AngelesTravel Guide and find tons of pet events! If traveling from out of town, booking early is essential when traveling with pets. See what’s available today so you get the best deals. Start your search for pet friendly hotels in Los Angeles here. Then sit back and think of all the fun things you can do when you get there!